I occassionaly search for (so-called) 'exotic Metal' releases. Meaning: bands from not-so-famous countries seem too keen on preserving the 'classic' Metal ideals, plus they do not focus that much on sounding 100% 'polished', plus the whole behaviour seems rather 'true'. Japanese Metal heroes BLASDEAD is such a case and - only by seeing their latest album released worldwide via the MAJESTIC ROCK label - I feel comfortable enough Ground Flare will be (at least) of personal interest. 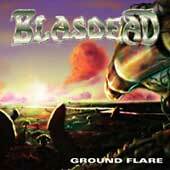 The 'flare' of BLASEDEAD goes back to the early 90s. Three demo tapes, participation in a bunch of (not only) Japanese compilations and the Another Dimension official debut in 1996 brought this Heavy/Speed Metal band in the front of the 'new' wave of Japanese Metal music. Ground Flare was originally released in 2006 via Black-Listed Productions, but only for the Japanese market. BLASDEAD deals with an interesting mix of the NWOBHM primal sound 'trapped' in the European Metal speediness. Most songs off the album feature fast tempos with straightforward guitars, while the guitar harmonies bear some similarities to post 80s Euro Metal blend. Thankfully, the band does come up with a harsh sound avoiding the 'happy Metal' sign. The solo work is interesting enough, some virtuoso playing will you hear from Shoji Yasuno; still, the axeman also delivers some neckbreaking riffs in each and every tune. Eiji Yokoyama has a wonderfully 'harsh' throat, full of metallic passion, but he does not succeed that much in the English language pronunciation. I do not find this to be a crucial drawback; it's just a notice to bear in mind. His range is middle-pitch-focused, by the way, bringing in mind two other Japanese Metal singers: ANTHEM's Eizo Sakamoto and (in his mid-tempo moments) LOUDNESS' Minoru Niihara. HELLOWEEN, RAGE, IRON MAIDEN and much of infamous Scandinavian Metal bands, played the 80s British 'fast Metal' way; that's what Ground Flare stands for. I don't know how many Metal fans will be interesting in this album - due to the 'overload' of relevant releases - but I think a band like BLASDEAD is worth the try, if it meets your 80s Heavy Metal needs.